We thank you, we thank you, from the depths of our hearts, and we know that every one of us is suffering in some way due to the problems of the economy. While our appreciation for you has always been strong and heartfelt, we thank you all the more right now for keeping our mission alive through these times. As you know, we economize every way we can, and we renew our pledge to you that we use your gifts with care and with prayer. Thank you so very much. As ever, you and your intentions remain in our daily prayers. 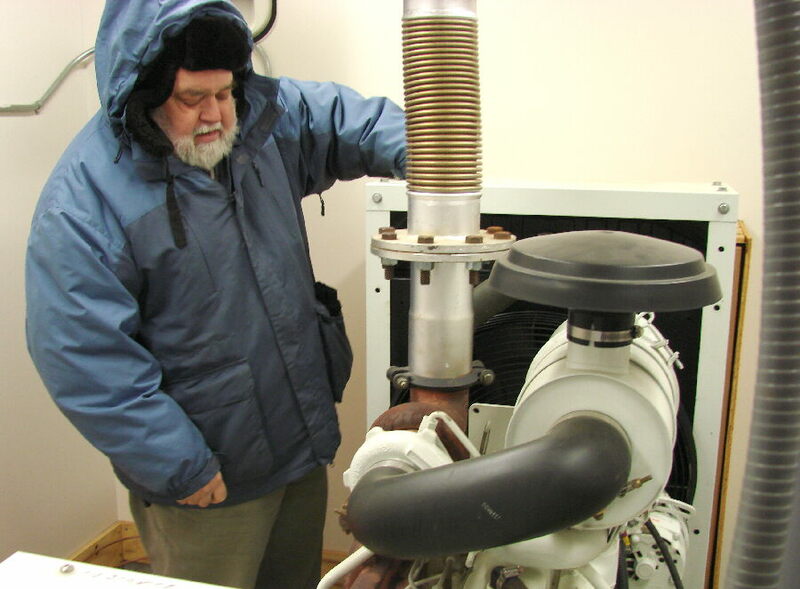 FAITHFUL SERVANT: (left) The 60 kilowatt generator at our remote transmitter site has served KNOM well, keeping us on the air for nearly 700 hours during outages since its installation in 1998.Here, Les Brown, who periodically flies to Nome to help out, checks it. SUBJECTIVELY: Recent topics on KNOM interviews and call-in programs spanned a great range: Suicide intervention skills, empty grocery shelves due to Mount Redoubt’s eruption, the Artists in Schools program in the village of White Mountain, the 2010 Census, fisheries issues, road maintenance, Beringia (berr-INN-jee-ah, a joint effort by the National Park Service and their Russian counterparts to preserve the Bering Sea region), the use of cell phones, natural disasters, renewable energy, home budget-cutting and the National Guard’s outreach to former soldiers who served in Iraq and live in remote villages. Public affairs director Laureli Kinneen produced a lively call-in program discussing seal oil, basically rendered seal fat that is critical to the diet of western coastal Alaska Natives. A FAITHFUL PROMISE: Since our mission’s inception in 1966, we have remained faithful to our promise that we will never provide your name and address to anyone, for any reason. The oldest Catholic radio station in the United States, working strong, thanks to you. INSPIRATIONAL SPOT: God will mend a broken heart if you will give Him all of the pieces. INSPIRATIONAL SPOT: It’s been a lovely day. Thank You, Father, for the gift of life. Already, nature is about to take on its summer beauty. Help us apply this lesson of nature to our daily living: A time for growing, a time for pruning, a time for harvesting, a time for yielding, a time for changing, a time for dying, and a time to think of new life. Grant this through Your Son, in the power of the Spirit. Amen. BRR: (left) As KNOM volunteer music director Laura Davis demonstrates, the Bering Sea off Nome is still solid with ice in mid-May. A mile or so offshore, you’ll find the ice thinning and cracking. Typically, the winter’s shore-fast ice breaks up suddenly and is swept out to sea. While this usually occurs between mid-May and early June, the ice has been known to cling to the beach until June 30th. 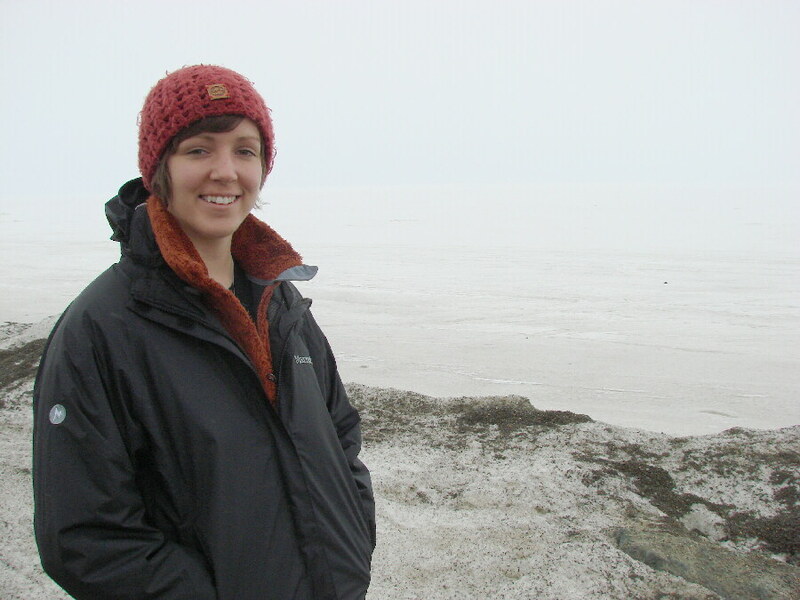 The material immediately behind Laura is plowed snow. 2,800: That’s approximately how many educational spots KNOM aired last month, along with an equal number of inspirational ones. Topics we covered included senior benefits, reading, coffee and health, Alaskan animals, overeating, child abuse, job opportunities, earth science, depression, mental illness, diabetes, Alcoholics Anonymous, foster care, depression and Alaska Native music. Thank you for making these broadcasts possible! SPEAKING of Alaska Native music, for decades, KNOM has aired one traditional Eskimo or Athabascan Indian dance every hour, from our library of 845 songs, most of them recorded by the station. It’s one way we are helping preserve and maintain appreciation for the ancient cultures of this region. The music is especially enjoyed by seniors, and young people love it, too! SPEAKING of Alaska Native music, recently you would have heard KNOM feature the Inu-Yupiaq (INN-yoo YOO-pee-ak) Dancers from the University of Alaska Fairbanks. We spoke with three students of the group, which features a blend of Yup’ik (YOO-pik, central) and Inupiat (in-OO-pee-at, northern) Eskimo members, as well as a German, and even a Russian. The program featured their performances at a recent regional conference, recorded by KNOM earlier this year. INSPIRATIONAL SPOT: Right this moment, take that worry that is eating away at you and turn it over to God. Refuse to brood over it any longer. Toss out doubt and fear. Leave it all to God. “NEW” HIRE: (left) He’s served as KNOM volunteer for three years, and if you’ve followed the mission during that time, you know him as a kind, generous and capable man. We’re delighted to announce that when his volunteer stint is up, Dave Dodman will fill a new salaried position, social outreach director. 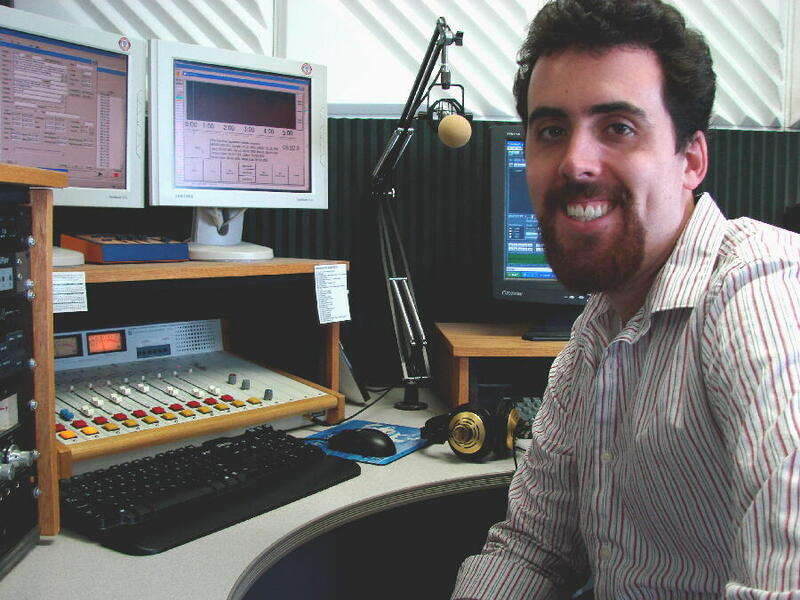 In addition to his extensive on-air work, Dave will review volunteer applications, keep the mission’s web site current, and make “tweets” on www.twitter.com/knom. The latter is an attempt to help keep younger people interested in the station. AIN’T WE “TWEET?” On news and talk shows lately, you may have heard about this new form of communication, provided by a free service called Twitter. Using computers or cell phones, one can send “tweets,” which are short messages that can be found and read by others. We use Twitter to announce special programs, guests on our talk shows, “Eskimo Stories and Legends” story titles, special music and so forth. WE ARE SAVING LIVES: For 100,000 square miles, if you want the weather forecast, KNOM is your best, and often your only source, especially during the summer at remote, isolated fish camps. “I hunt and fish down to the mouth of the Yukon, and upriver (about 250 miles) to Holy Cross,” writes a man. “All up and down the river, people keep KNOM on, and when they hear you announce that bad weather’s coming, they hightail it to a village or hunker down at camp until it clears. HIGH WATER: Throughout most of our listening area, the spring season has yet to arrive. Upstream on the Yukon River, however, and to the south, over 30 villages are suffering flooding as ice jams back up melt water, inundating towns, in some places destroying homes. Please pray for the safety of everyone in our region during these unusually high waters, won’t you? Please consider adding the KNOM mission to your will. We place all bequests into funds that provide for future major improvements, or protect the mission during unexpected emergencies. INSPIRATIONAL SPOT: There is not enough darkness in all the world to put out the light of one small candle. KA-BOOM! 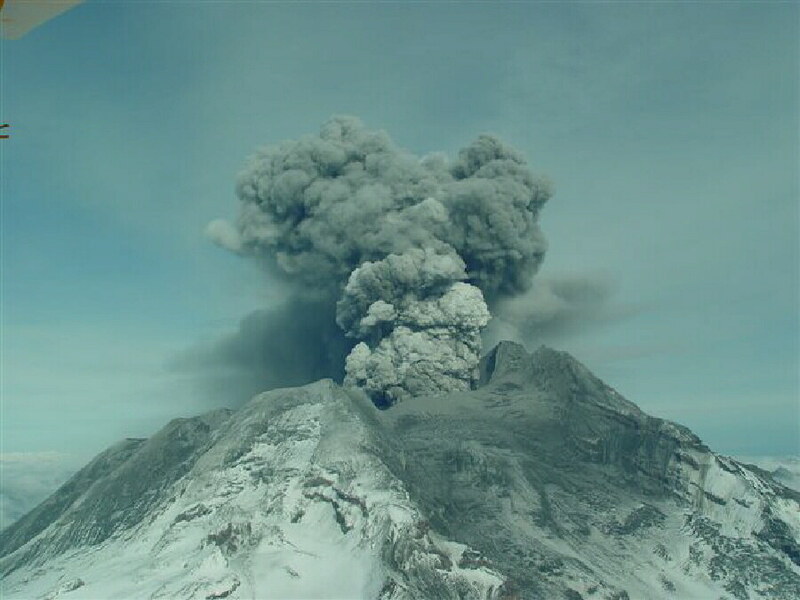 (left) Mount Redoubt volcano erupts, spewing sulfurous, abrasive ash high into the air. As this is written, it’s been six weeks since the mountain halted air travel and shipment of supplies and mail to Nome, 539 miles from Anchorage, for several days. However, scientists expect another explosive event in the next few months. The photo is courtesy of James Isaak, via the Alaska Volcano Observatory. THIRTY YEARS AGO: In June 1979, on a medical evacuation flight to Anchorage, KNOM volunteer support nurse Trese Ptaszynski, RN, delivers a baby inside a 5-passenger Piper Aztec at 10,000 feet altitude. Mother and child are fine. In 1979, nurses like Trese account for 69% of the station’s income. They work at Nome’s hospital, live as volunteers and contribute their entire salaries to the mission. TEN YEARS AGO: June 1, 2 and 3, 1999, KNOM’s daily “Profile” interview programs are devoted to the prevention of suicide, a pervasive problem in western Alaska. June 20, 1999, Nome reaches 74�, twenty degrees warmer than usual. There are no complaints. ENCOUNTER: Last month, KNOM general manager Ric Schmidt happened to meet a man, who, in Ric’s words, “said that his mother was not doing well in the village and relied on KNOM for inspiration, news and just to stay connected with folks. Every so often, he and others sent her little messages over the air." We would like to put our signal onto the Internet, but we calculate that at present rates, the royalties we would have to pay for the music we broadcast, and the extra expense of accounting for it, might be as high as $100,000 a year, clearly more than we could afford. Once more, we thank you and we honor you for your support and your prayers. Again, you and everyone you love are in our prayers, too. May Our Almighty Father guide you, protect you and bless you abundantly!